Maine Sports Media: The "Welcome to the #RedSox, Anthony Ranaudo" links. The "Welcome to the #RedSox, Anthony Ranaudo" links. He is going to be fun to watch with the Sea Dogs next year. Theo and the entire scouting department have done it again; Red Sox sign highly touted starter Anthony Ranaudo. 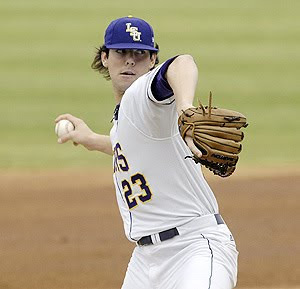 He was the top ranked preseason college player of the year at LSU in 2010. The complete list and breakdown of all the Red Sox picks and signings of the 2010 draft. He's back. Sort of. The Spaceman himself Bill Lee signs with the Brockton Rox. Joe Haggerty breaks down the Red Sox playoff chances. If the Patriots are going to get help for the pass rush, it won't be from Aaron Schobel. CSNNE's Tom Curran breaks down the Saints/Patriots preseason game. Tom Brady playing the Jerry Rice and Joe Montana card again when talking about his contract situation. Bangor records another victory in the Senior League World Series. Ernie Clark thinks Jack Cosgrove is an easy choice to be the next Black Bears AD.